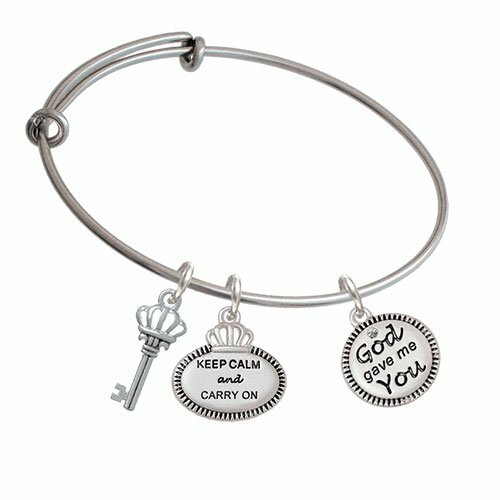 Silver Plated God Gave Me You Silver Keep Calm and Carry On oval charm with Crown and matching Crown Key Expandable Bangle Bracelet. Silver Plated God Gave Me You Disc is approx. 0.74 x 0.63 x 0.11 (HxWxD) including loop. Disc has an antiqued border and is embellished with a clear Austrian crystal on one side. Same on both sides. 2.75 inch Rhodium Plated Bangle can adjust up to 3.25 inches. Available in popular themes such as Happiness, Faith, Luck, Holiday, Angles, Marathons, Best Friends, Keep Calm, I love you to the Moom and Back, and many more. This Bangle looks wonderful alone or layered with other Bangles to match your style. Makes a great gift!